In California, sun-kissed rolling hills are covered with grapevines as far as the eye can see. We’ve selected three distinctive bottles of wine, a chardonnay, sauvignon blanc, and cabernet, and surrounded them with a bevy of delectable local flavors. This gift is ideal for an occasion. 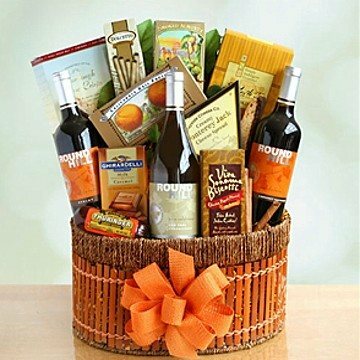 This gift includes the following: Three bottles of California wine (brands vary) English tea cookies, cheese, Dolcetto wafer cookies, California smoked almonds, sourdough crisps, salami, biscotti, California hard fruit candies and a Ghirardelli milk chocolate and caramel bar. It’s a tour of the wine country for all to enjoy.